With bodhichitta you become so precious – like gold, like diamonds. You become the most perfect object in the world, beyond compare with any material things. Lama Zopa Rinpoche in Singapore, March 8, 2013. Photo by Stephen Ching. Lama Zopa Rinpoche‘s endless capacity for benefiting others is evidenced by the many charitable projects he has initiated, supported and developed. 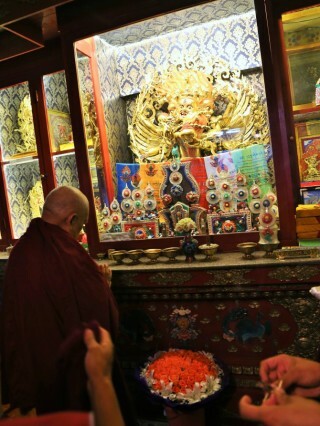 Rinpoche generously offers support to a variety of social and charitable activities; monasteries and nunneries; the international community of Sangha around the world; FPMT centers, projects and services; prayers, practices and pujas dedicated to the success of the entire FPMT organization and all beings, among many other projects. The Lama Zopa Rinpoche Bodhichitta Fund enables Rinpoche’s compassionate service to others to flourish. To keep up on how your donation is being used and to rejoice in the activities, please follow the Lama Zopa Rinpoche Bodhichitta Fund News. Learn more about Lama Zopa Rinpoche and Lama Zopa Rinpoche’s teachings on bodhichitta. Lama Zopa Rinpoche with His Holiness the Dalai Lama. India, January 2014. Photo courtesy of the Office of His Holiness the Dalai Lama. Offering support to the Dharma, Sangha and His Holiness the Dalai Lama is a high priority for Lama Zopa Rinpoche. 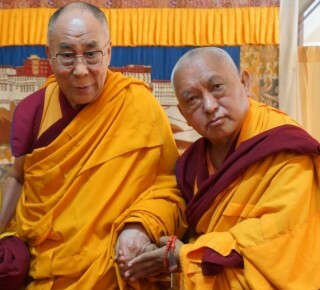 Through the Lama Zopa Rinpoche Bodhichitta Fund, Rinpoche has personally donated, or raised US$2,315,000 for the direct support of FPMT western Sangha and the support for monasteries and nunneries in the West. Additionally, Rinpoche has offered over US$3,187,900 toward supporting various monasteries, khangtsens (houses) and retreat facilities in India, Nepal and Mongolia. 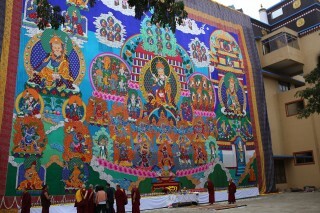 Large thangka of Guru Rinpoche sponsored by the Lama Zopa Rinpoche Bodhchitta Fund. Photo by by Ven. Thubten Kunsang. Through the Lama Zopa Rinpoche Bodhichitta Fund, Rinpoche supports the creation of many impressive and beneficial holy objects around the world which are a part of Rinpoche’s vast vision, which includes the plan to build 100,000 stupas and prayer wheels for world peace as well as many large thangkas and Padmasambhava statues. Notable amongst these are the two Maitreya Projects, that are being built, in Bodhgaya and Kushinagar, India as well as the plan to build another 1,000 other Maitreya statues; and The Great Stupa being built near Bendigo, Australia which is 164 feet square at its base and nearly 164 feet high making it the largest stupa in the Western World. The presence of many holy objects in the world enables all beings to purify negative karma, collect extensive merit and in this way bring happiness to all beings. 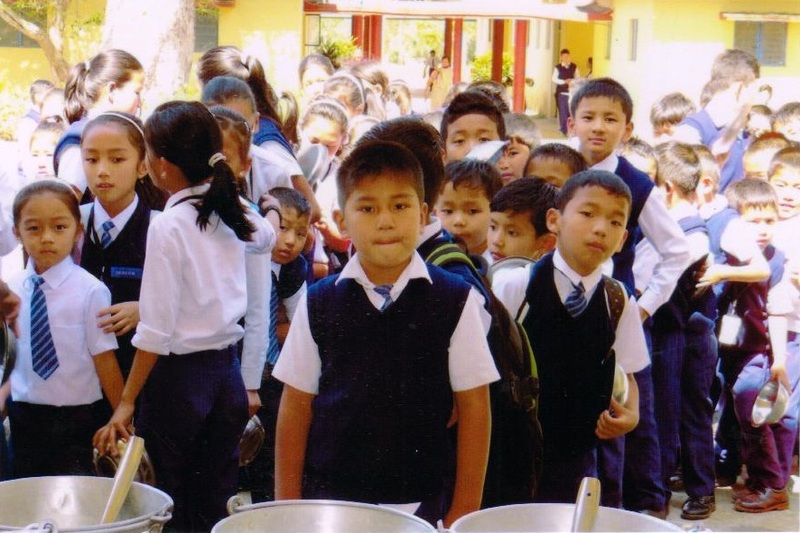 The children of Central School for Tibetans are offered a good quality vegetarian meal every day for lunch, through the Lama Zopa Rinpoche Bodhichitta Fund. Through the Lama Zopa Rinpoche Bodhichitta Fund, Rinpoche offers a range of support to many social service activities. Some of these offerings include: food offered daily to all the students studying at Ngari Institute of Buddhist Dialectics in Ladakh, India; as well as the midday meals and financial support for the kitchen renovations for the Central School for Tibetans in Bylakuppe, India; classrooms in Sera Je Monastery, India, as well as support to health care services for Tibetan people; among many other projects in need of support. Lama Zopa Rinpoche and director of Vajrapani Institute, Fabienne, discussing the art for a new Lama Yeshe statue. When Lama Zopa Rinpoche travels to FPMT centers, projects and services around the world, he always tries to offer support in anyway possible. Through the Lama Zopa Rinpoche Bodhichitta Fund, Rinpoche recently offered US$50,000 toward a new stupa at Land of Medicine Buddha, US$10,000 for a Lama Yeshe statue at Vajrapani Institute, sponsorship of FPMT students and Sangha to engage in Dharma retreats and practices, continual support of FPMT International Office; financial resources to the FPMT Puja Fund, which sponsors ongoing pujas and practices for the whole organization; as well as creating and sponsoring many ways to benefit animals. All these activities are done to create merit for the organization to be as beneficial as possible. The beautiful Nyung-Na altar and retreaters who just completed 108 Nyung-Na’s at Institut Vajra Yogini, France. Many Dharma retreats are supported through the Lama Zopa Rinpoche Bodhichitta Fund. 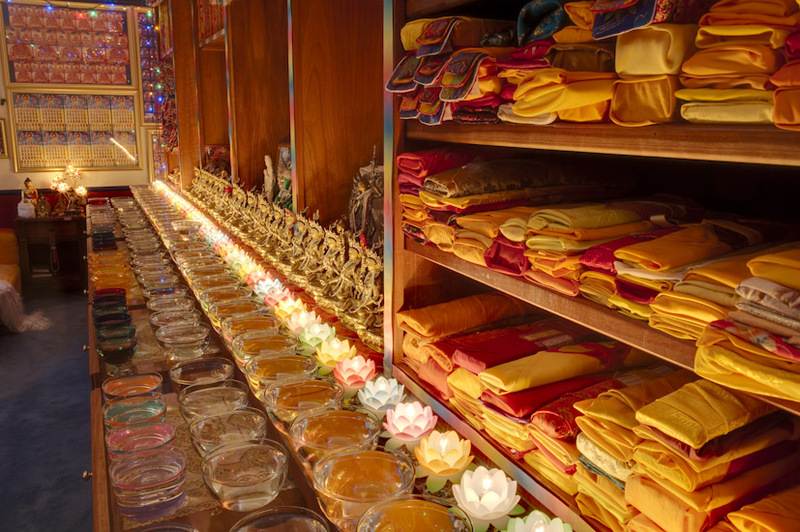 These practices are dedicated for the success of the entire FPMT organization and students; benefactors, volunteers and their families; as well as those who are sick or passing away. 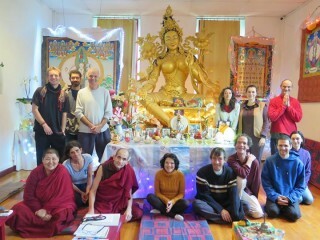 For example, since 2012 Rinpoche has sponsored 10 people to complete 108 Nyung Nä retreats annually at Institut Vajra Yogini in France, since 2009 sponsored annually 100 Million Mani Retreats at Tashi Chime Gatsal Nunnery in Nepal, this includes all the food and providing the nunnery with a highly qualified Dharma teacher, sponsored the continual writing of the Prajnaparamita sutra in gold, that will eventually go into the heart of the Maitreya Statue in India. Rinpoche’s vision for the organization is to be able to offer more support for practitioners by sponsoring students to do 1000 Nyung Na’s and to build a retreat property dedicated especially for serious Dharma practitioners who want to spend the rest of their life in retreat. Extensive offerings at Lama Zopa Rinpoche’s California residence. Photo by Whitney Dafoe. The Lama Zopa Rinpoche Bodhichitta Fund offers finances to support continuous light offerings in Mongolia, India and USA; and ongoing support of Sangha making thousands of light and water offerings daily as well as other extensive prayers and practices for entire FPMT organization and students; benefactors, volunteers and their families; as well as those who are sick or passing away. 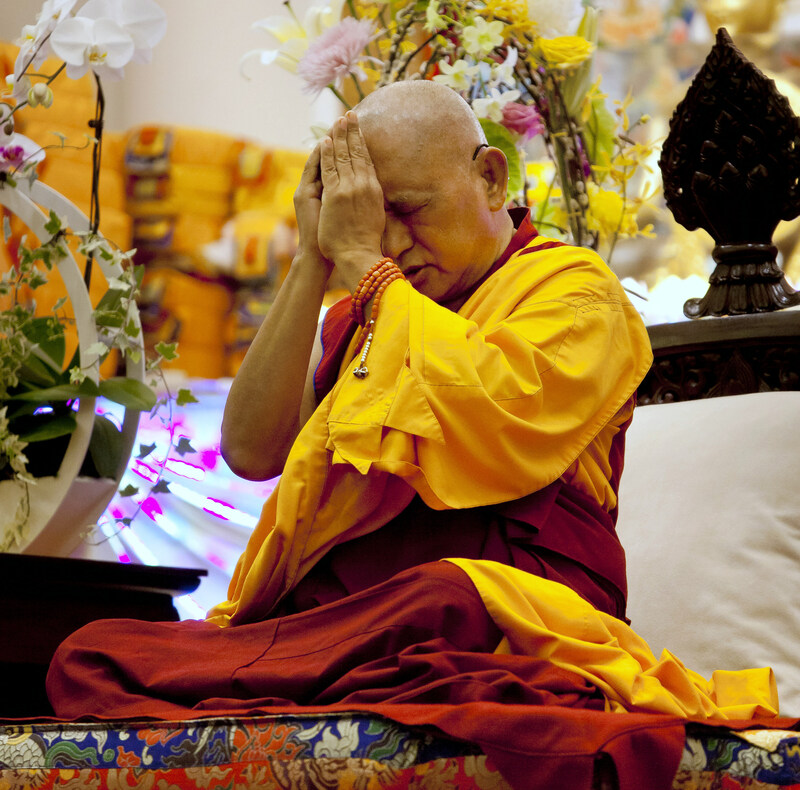 Lama Zopa Rinpoche has inspired daily extensive offerings around the world. 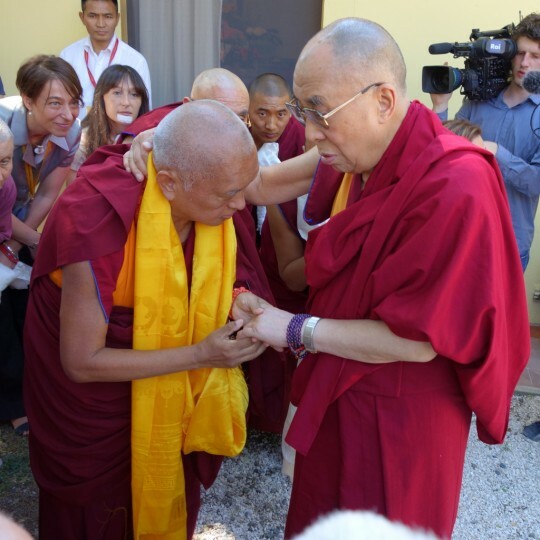 His Holiness the Dalai Lama with Lama Zopa Rinpoche at Istituto Lama Tzong Khapa, June 10, 2014. Photo by Ven. Roger Kunsang. Lama Zopa Rinpoche does not keep any personal money for himself, he utilizes everything that is offered for these beneficial projects, plus many more. Or simply send your check in US dollars payable to FPMT, Inc. and write “Lama Zopa Rinpoche Bodhichitta Fund” on the memo line. Lama Zopa Rinpoche Bodhichitta Fund is a project of FPMT, Inc. and is administered by FPMT International Office located in Portland, Oregon, United States. All donations made to this fund are tax-deductible within the United States in accordance with IRS Code article 501(c)(3) to the extent allowed by law.